We are a long way from seeking to "arrest our way" out of the drug problem. Only a small percentage of drug arrestees are ever sent to prison, and the vast majority of those behind bars for drug offenses are guilty of substantial trafficking, not possession. 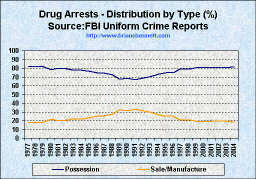 But why do we arrest drug users at all? Remember - These People Are Doing Things to Themselves. So what exactly are we accomplishing here? 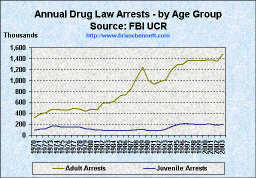 The statistics reflected in the graphs above, demonstrate a continuing increase in the number of persons arrested for drug-law violations during the period from 1970 - 2004. 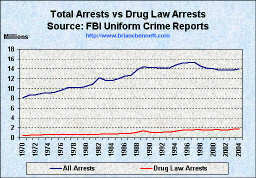 By 1999, the number of arrests for violating drug laws accounted for 11 percent of the total of all arrests, and simple drug possession accounts for 80 percent of all drug arrests. 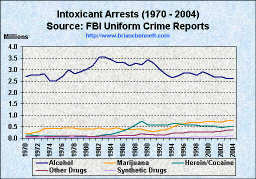 No one was beaten, robbed, or killed to cause these arrests. If what these people do does not warrant jail time, then what sort of "danger" do they pose to society? Why are we arresting people who do things to themselves?